Our classes for women and the female-identified are inclusive, noncompetitive, comprehensive, and they use a feminine approach to the subject matter. You’ll come away from them with real, practical skills and a deeper sense of esteem for yourself as a person and a woman. Feeling capable is a human birthright. Living with confidence in our ability to care for and do things for ourselves is empowering and satisfying. For too long, women haven’t had opportunities to learn the tools for self-sufficient living. Oftentimes, when we have had the chance to learn, it’s been on male terms and in male-dominated situations. We’re excited to make a change! Classes for women that put empowerment in our own two hands. It’s time to learn on our terms. Classes for women aren’t just classes for men with female teachers. We believe that women’s empowerment is as much about the specific skills we need as it is about reclaiming our natural way of doing things. Teaching classes for women is rewarding and fun because, during the classes, we get to create the kind of gender equity and acceptance that we want to see in the world. The reason that women don’t often feel confident with “hard skills” like carpentry and woodworking is not because we just aren’t good at them. It’s also not because we’re not interested. Too often these skills are taught by men in a very linear, outcome-oriented, male sort of way. Our classes for women and the female-identified take into account a more feminine learning style. We put a focus on learning as we go, encouraging students to ask questions and ask for help. We work on group projects, along with individual ones, and we share meals together. This sense of togetherness and connection with the group helps everyone feel safe and welcome. We highlight different abilities and strengths, noticing that everyone’s contributions are needed and that they come in handy in different ways. Teaching the trades to women opens doors. 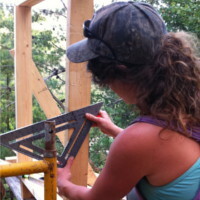 One of our most popular classes is Women’s Basic Carpentry. So many women want to know how to build things! And we’ve seen over the years that they have really good ideas and designs. Many of them are really good builders. Without our classes for women, who knows if these folks would have ever been able to realize their visions? Their projects could have stayed in their imaginations forever. 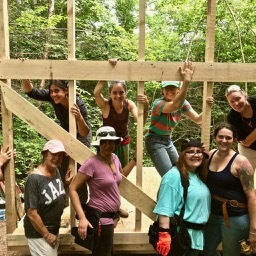 Our Advanced Women’s Carpentry class teaches structural building, so women and the female-identified can put up their own sheds and gazebos and even build their own houses. Teaching these foundational skills allows women to follow their dreams. Some women dream of working in the trades, but just don’t know how to break into such a male-dominated world. Our humble hope is that our classes for women open the door for those women who want to be builders. Rewilding for women: connecting with our roots. The roots of our school go deep into the earth-based ancestral arts that inspired us so many years ago. Interacting with the natural environment and learning the skills and crafts of our ancestors has enriched our lives. Rewilding has grown our confidence and sense of place. We know from personal experience that connecting with the undomesticated parts of ourselves is at the foundation of empowerment. We’re excited to offer a course in women’s primitive skills that covers such basic human acts as making fire by friction and foraging for medicinal plants. It also includes soapmaking; basketry; and menstrual, moon and menopause rituals, plus more. Of all of our classes for women, this one dives deep into what it means to be a human woman and how we can embrace the feminine parts of ourselves in our everyday lives. Apprenticeships for women who are ready to change their lives. Every year we welcome a few motivated individuals to be our apprentices. It’s the best way to learn all that we teach and to experience life on a permaculture homestead. Natalie Bogwalker, our founder and director, is the main instructor for the apprentices. Our apprenticeships for women provide an opportunity to learn directly from this highly skilled and experienced woman in an intimate, small-group setting. The apprenticeship program is also open to men, and Natalie’s partner, Frank Salzano, along with other friends and neighbors, also guide and instruct apprentices. We create an inclusive environment throughout the apprenticeship season that fosters communication, honesty, vulnerability, personal growth and individualized learning.